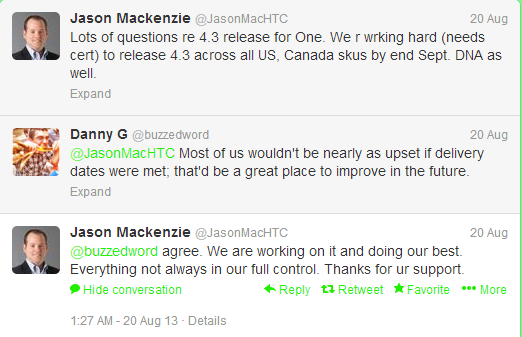 Looks like HTC is going to be the second one to get its devices updated to Android 4.3 Jelly Bean. Remember I had given a list of specific devices which would be updated to Android 4.3 Jelly Bean in coming months. In that post I had mentioned that HTC will be the only loser in the Android 4.3 Jelly Bean race because it just had 4 major launches this year and HTC One is one of them along with HTC One Mini. As you all know HTC is quite notorious when it comes to updates. The HTC smart phones have somehow been last to adapt to the latest versions of Android, so keeping my fingers crossed. However in another development, Jason confirmed that HTC One developer version user will get a Android 4.2.2 minor update and the phone will directly get updated to the Android 4.3 Jelly Bean.